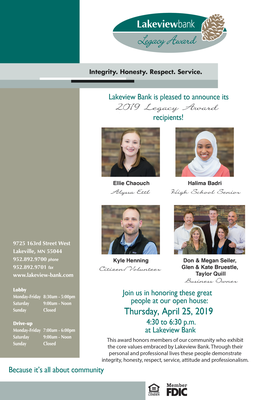 Please join us in honoring the 2019 Lakevile Bank Legacy Award winners. This award recognizes and honors members of our community who exhibit the core values embraced by Lakeview Bank. Personally and professionally, these people demonstrate integrity, honesty, respect, service, attitude, and professionalism. Each recipient will be awarded $1,500 that they can use to further their education or contribute to a charitable orgnization of their choice.